Want to get your kids to eat salad? Make it a taco salad. No kid can refuse that, right? Here is an easy one you could make in your sleep. Or blindfolded. Or with one hand tied behind your back. 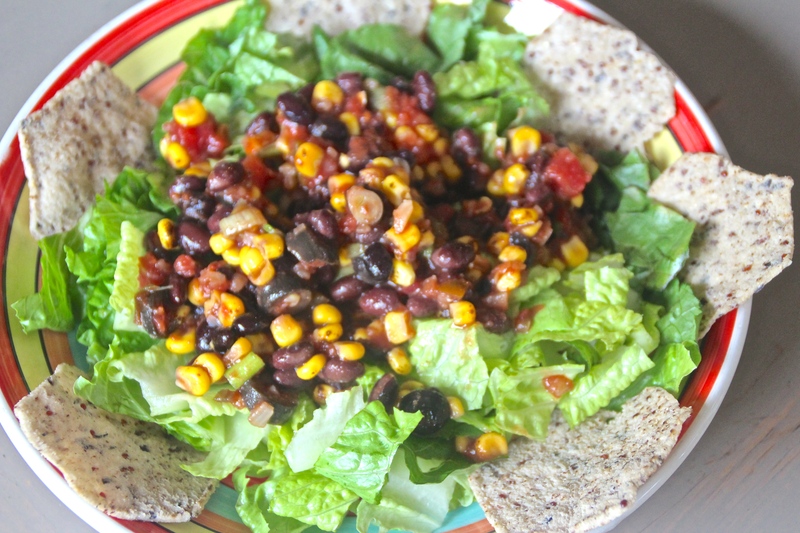 Easiest Taco Salad on the planet. 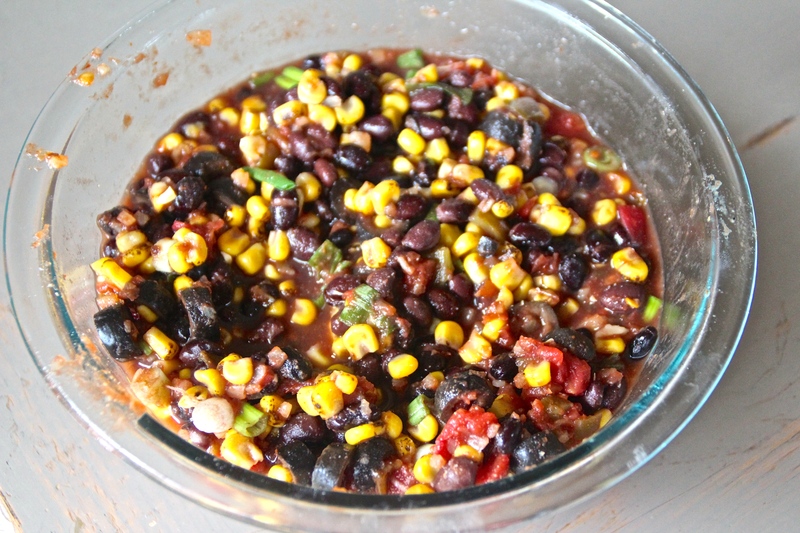 Mix first 5 ingredients in a large bowl. 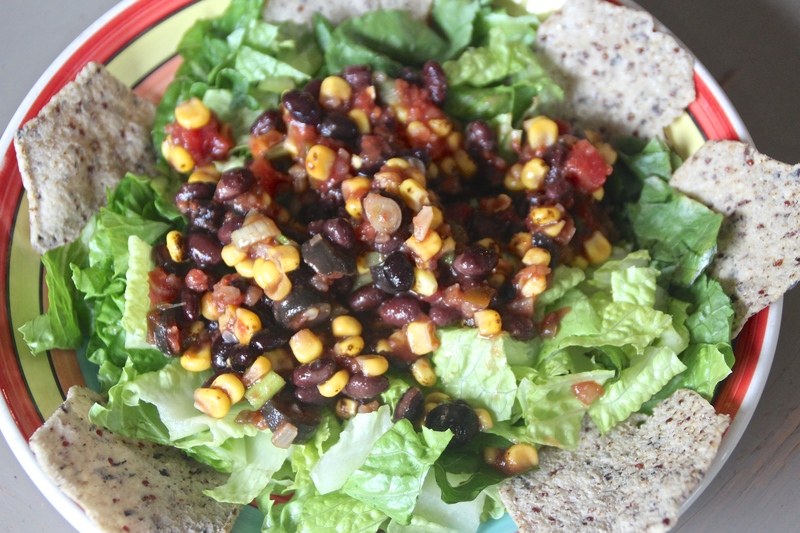 Pile it on romaine lettuce and add your chips to the sides or crush it on top. No need for any dressing. Once this salad is mixed up the salsa adds plenty of “wet” to the lettuce. Good stuff! 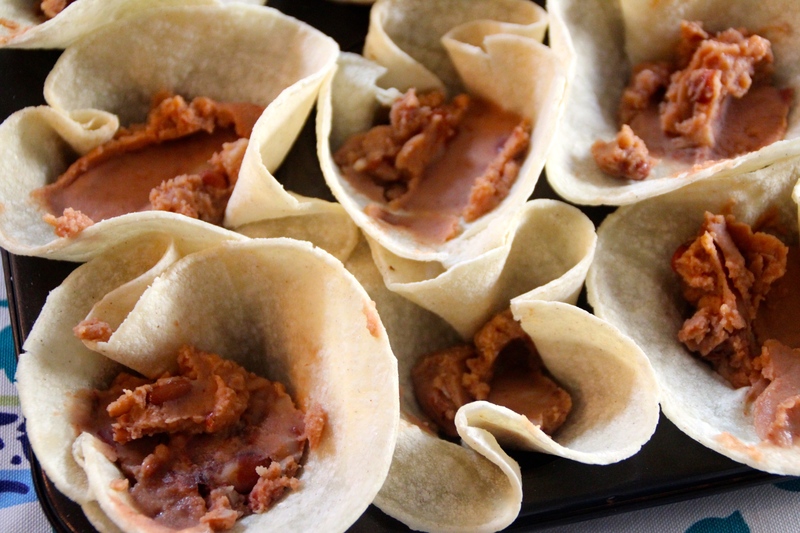 Have you seen these baked tortilla cup things floating around Pinterest? Me too. 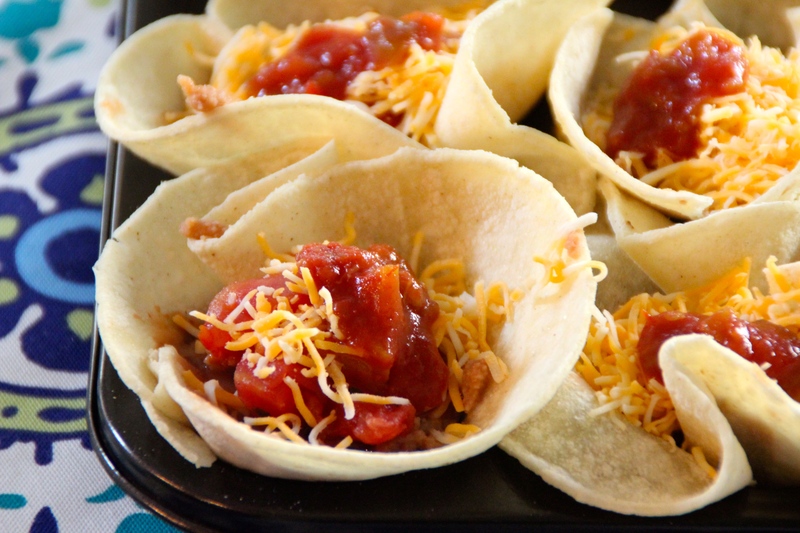 However, when I have seen the baked tortilla bowl-like things on the internet, the recipe calls for them to be baked on the backside of a muffin tin. 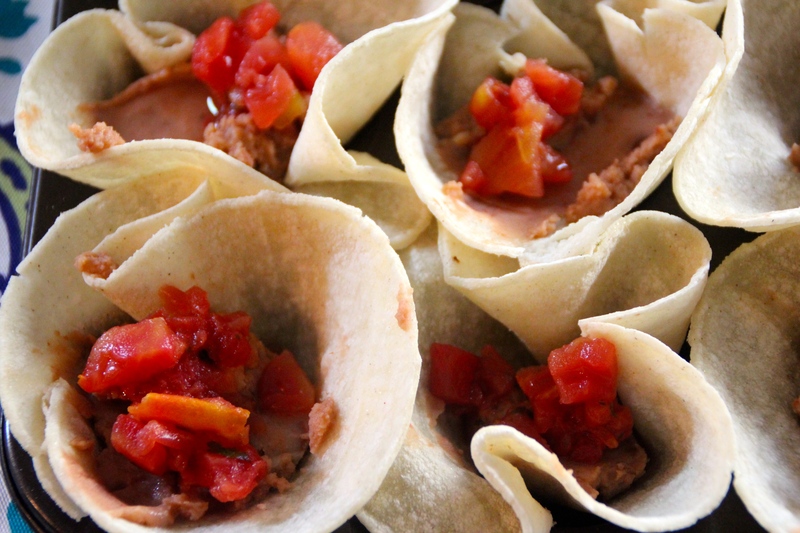 The muffin tin creates the mold and the corn tortilla bakes into this cool lipped, edible bowl thing. As fun as they are, I alway felt like it was such a waste of space because you can only fit a few tortillas on the back of the muffin tin. That said, I have been wanting to try this for quite some time, but in my own attempt I wanted to save some space and use the actual muffin compartments..Here goes nothing! First off, I started with super basic goods. Nothing fancy here. 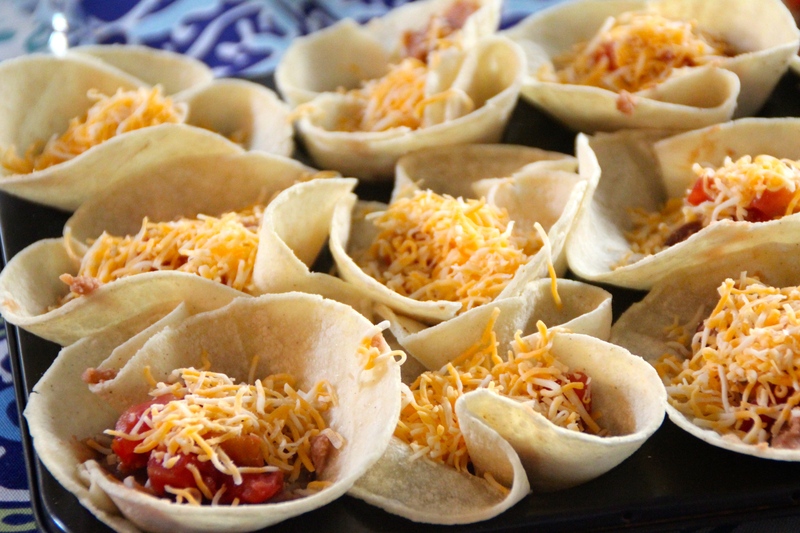 After heating the tortilla, I molded them into the muffin tins and added some beans in each cup. Then I added some of the tomato/green chile mixture. Baked it up and topped with avocado and hot sauce. Not bad for a baked tortilla newbie! 2. Spray the muffin tin with cooking spray. 4. 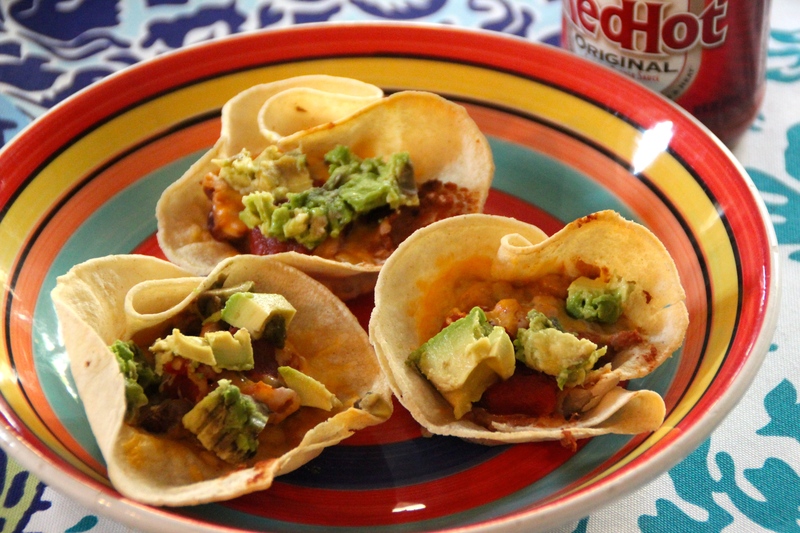 Mold the tortillas into the muffin tins, layering the sides if need be. 6. 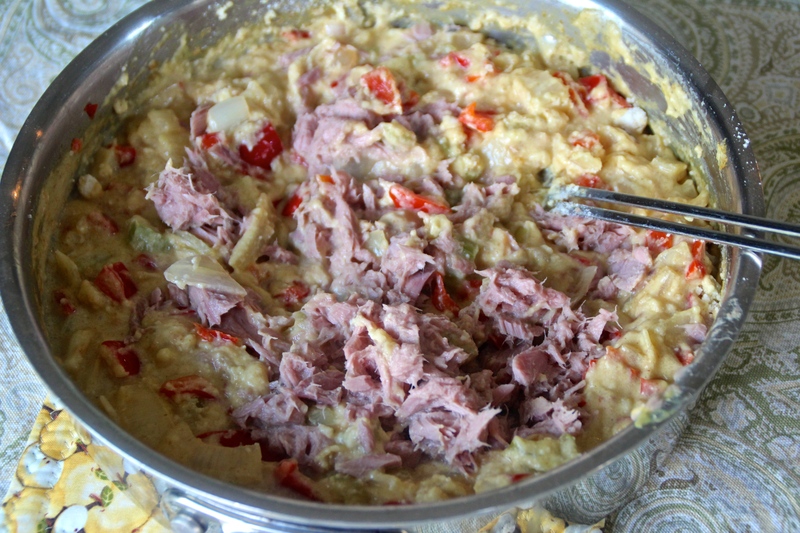 Top with the tomato/chile mixture. 6. 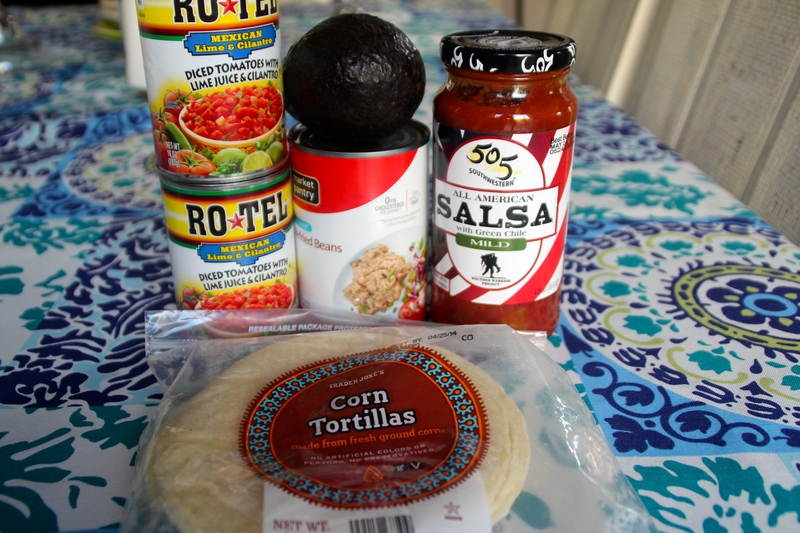 Top with the salsa. 11. Add hot sauce if desired, but duh, YES! All 12, polished off. The biggest problem?? There was not enough of to feed a family of five. Should have doubled it! Although I know how horrible the stuff is now (for health), I still kind of miss it. Nostalgia food? Miss it, yes, but it doesn’t mean I am running through Walmart to buy it. Let’s healthify this instead. Impeccable timing too because I made this recipe during teacher appreciation week at my 13 year old’s school. Her middle school needed 100 casseroles so that each teacher had one to bring home, so they asked parents to step up and contribute a casserole. Guess what? 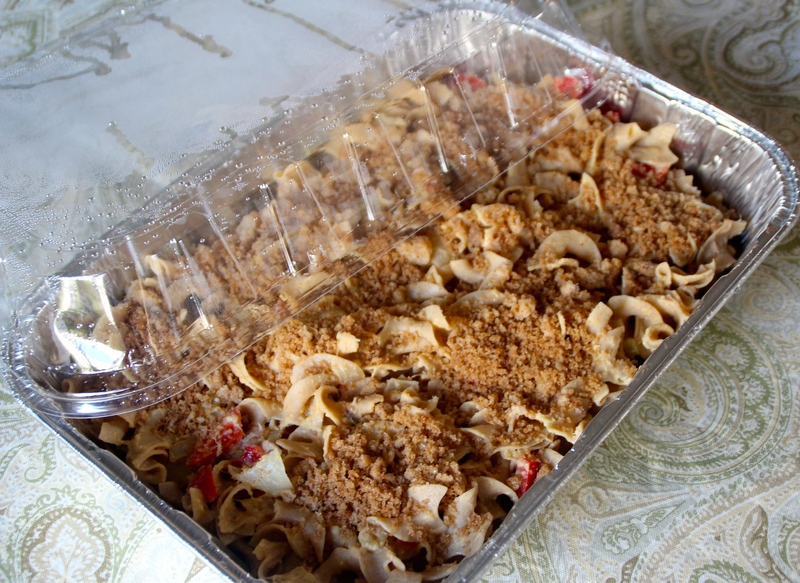 Some poor soul lucky teacher got my healthy tuna noodle casserole. Hopefully they were pleasantly surprised. Start by cooking up some veggies. 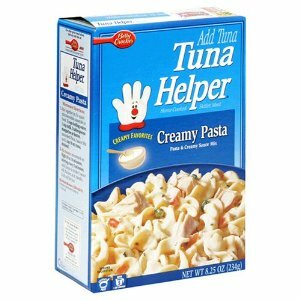 My recipe does not have the mystery green pea-ish things like Tuna Helper. Figured I’d up the antioxidant content of this dish. Peppers, celery and onions it is. 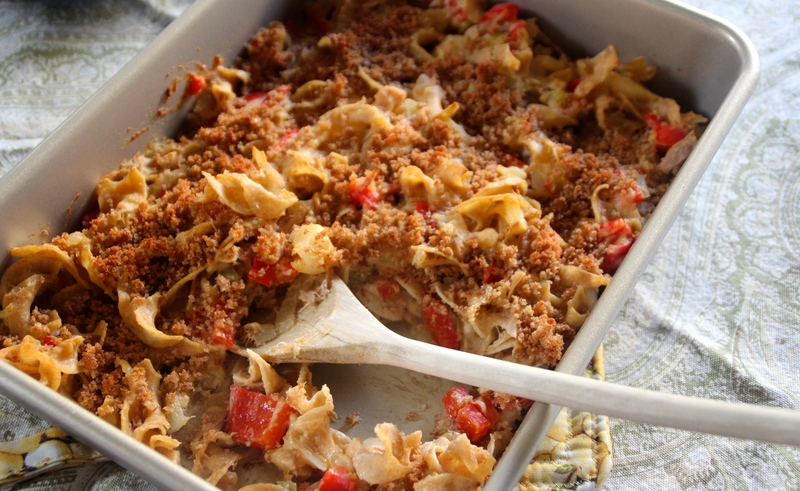 Add your flour, nutritional yeast, milk, mustard..(the creamy factor in this casserole) Give it a good stir, don’t be shy. Then incorporate your noodles. Next add tuna and parmesan. Stir, stir. The recipe below was enough for two casseroles. We had one for our family, and I made one for one lucky teacher. :/. I really could have piled it all into one 9×13 pan and cooked it a tad longer, but chose to split it up. 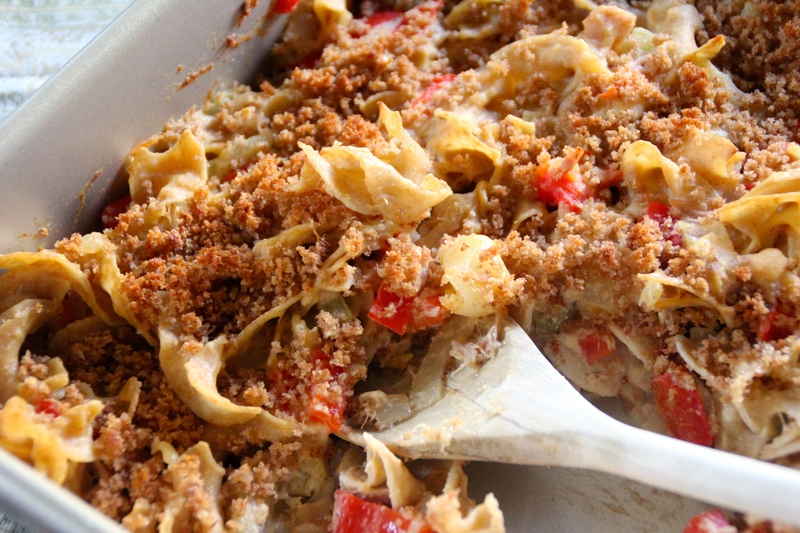 We ate our whole casserole that night, but you could keep the recipe as is and have leftovers for work. 1. Preheat the oven 350 degrees. 2. Cook egg noodles according to package instructions. 3. Heat a large pan over medium heat. 4. Add your butter to the pan. 5. 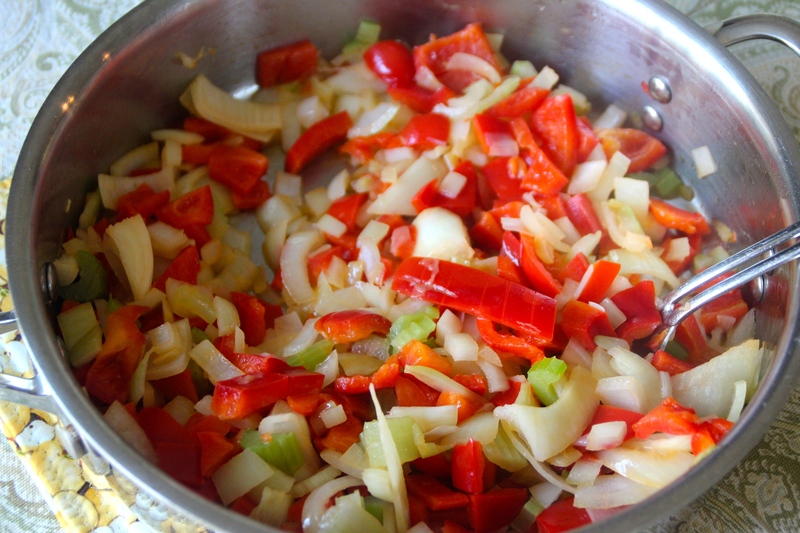 Add the onion, celery, and bell pepper and saute for 5-6 minutes to soften. 6. 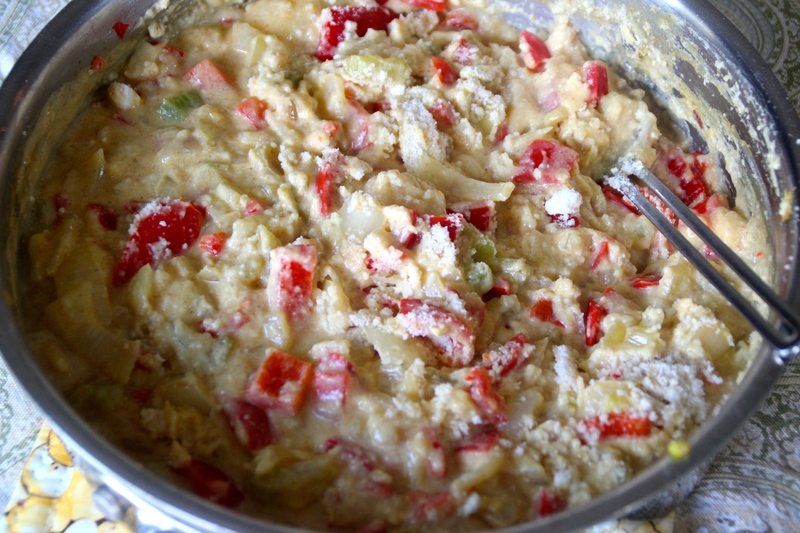 Mix in the flour and nutritional yeast and stir to coat the vegetables evenly. 7. In a small bowl, whisk the milk and mustard. 8. Pour into the vegetables, stirring to blend. 9. 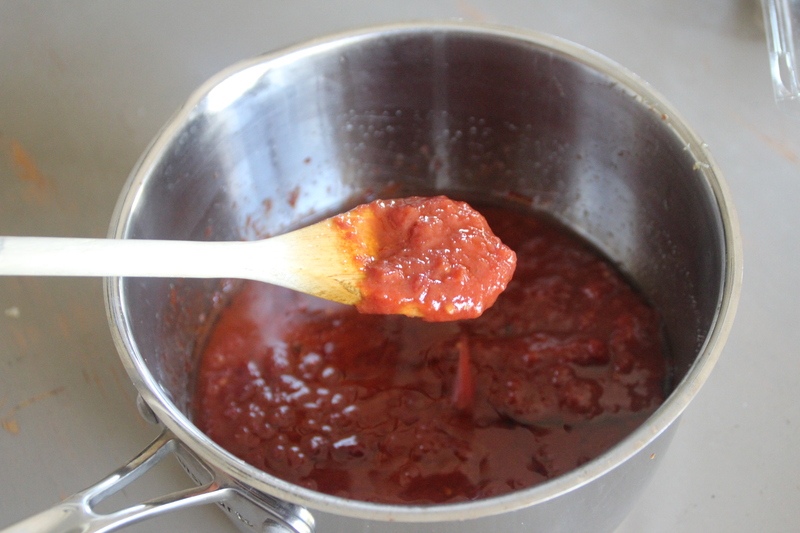 Cook and stir for another 5 minutes (or until the mixture is thick) and turn off the heat. 10. Add the salt and the parmesan cheese. 10. 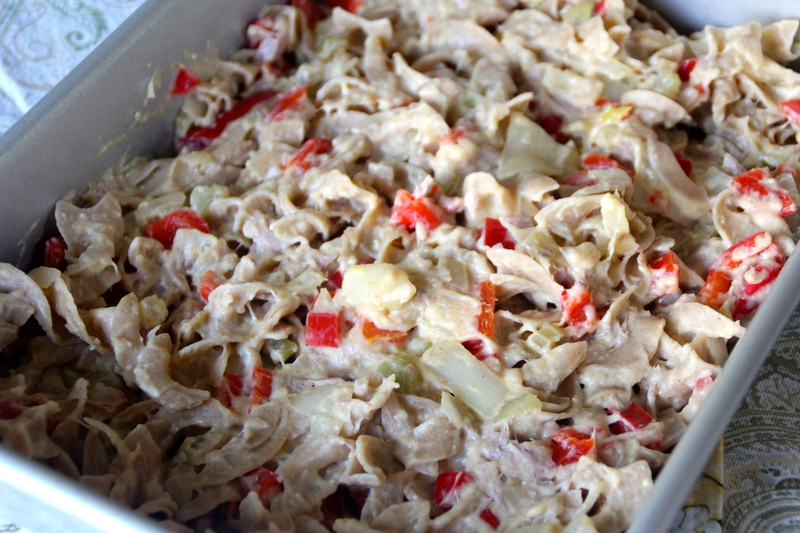 Stir in the noodles and the tuna and mix to blend. 11. Pour into a pre-sprayed 9”x13” pan. 12. 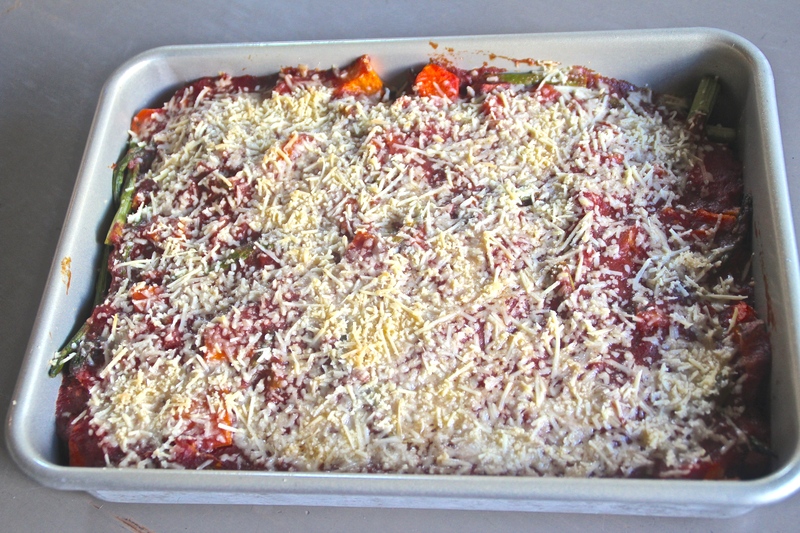 Topping: Mix together the breadcrumbs, oil, and minced garlic and sprinkle evenly over the top of the casserole. 13. Bake in the oven for 15 minutes. 14. Switch oven to Lo broil. Broil for another 5 minutes creating a crisper topping. You would think with all of the veggies this household consumes that I would be this insane gardener. Insane gardener I am not. I kill plants, not purposely of course, but I just do not make them my top priority and by the time I realize they have dried out or are seriously diseased, they are on their deathbed. Needless to say, I would probably not make the best vegetable gardener. Not that I don’t wish that I was. And yes, I have attempted to grow a few edibles along the way. 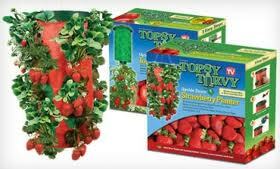 Remember the Topsy Turvy things? I had a strawberry one a few years ago. It had a couple of small strawberries, “yay, me!”, but then the stupid thing fell off my deck (to its death) and the remnants got munched on by some sort of rodent. grr. I tried to grow herbs in my window 3 years ago…Only to have them grow for a few weeks, tease me, and then die. Failure two. I went up north for the whole month of August. My herbs paid the price and did not survive my vacation. Okay my point in this story? I am attempting herbs (again) and venturing out and growing tomatoes in a pot at the moment. Super excited. I know to most a lousy tomato plant is not a big deal, but this is big for me. Stay tuned. 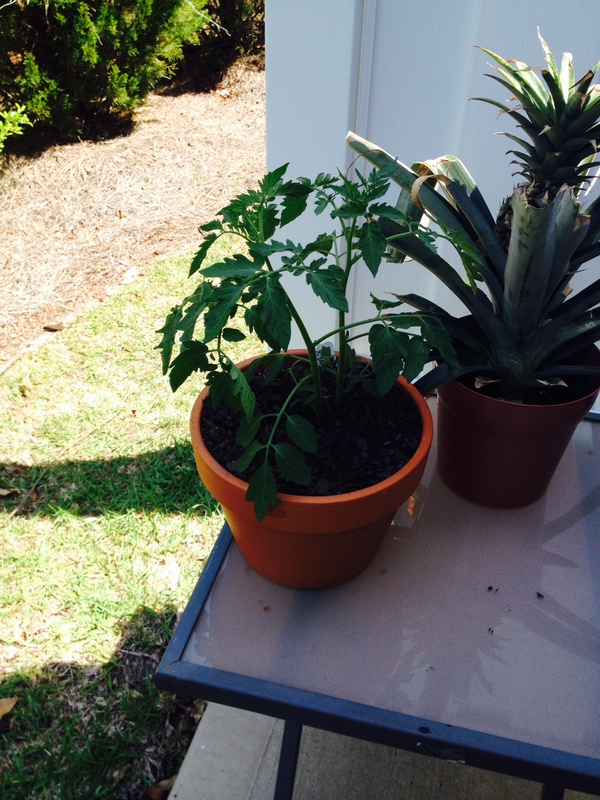 My tomato plant. Cherry tomatoes, but still, tomatoes. 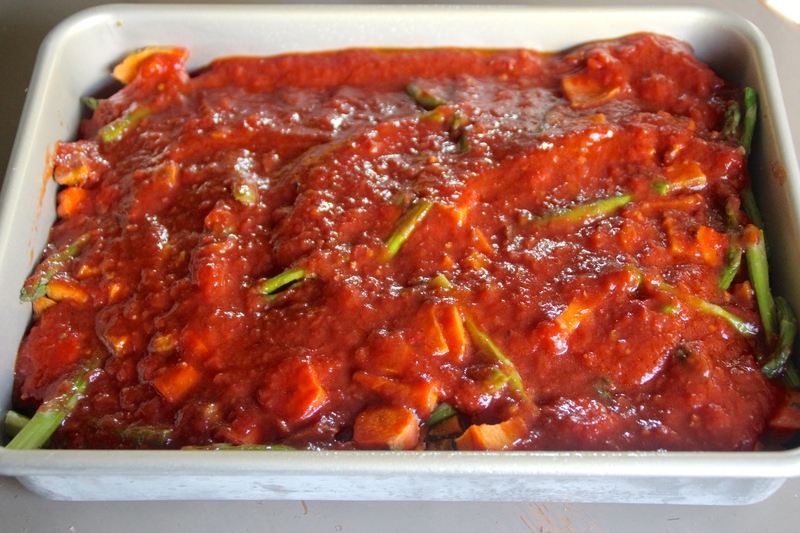 Speaking of tomatoes…Today’s recipe is a yummy marinara with rice and roasted veggies. This sauce was so good, I could have eaten it solo. Top it and bake it. A well balanced meal, no meat required. Spread rice at the bottom on the dish. Top with your roasted veggies. Peel the sweet potatoes and carrots. Then cut up into chucks about 1/2 to 3/4 inch thick. Just keep them somewhat similar to ensure even cooking. Trim the ends off of the asparagus stalks and cut into 2 inch long pieces. 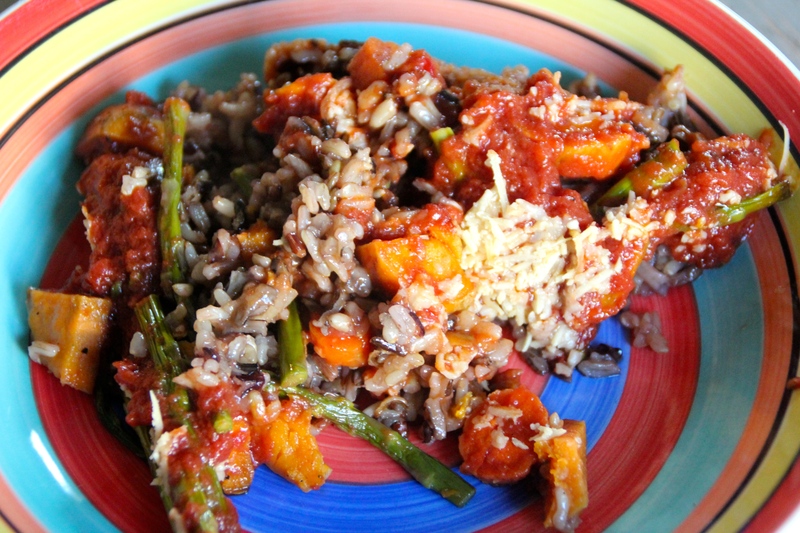 Place the sweet potato and carrot pieces into a bowl with 1 tablespoon olive oil. Toss well so that the vegetables are coated evenly. Add asparagus pieces into another bowl, then add 1 tablespoon olive oil and salt & pepper. Spread the sweet potato and carrots onto a prepared baking sheet. Bake for 20 minutes (stirring midway). Remove the baking sheet from the oven. 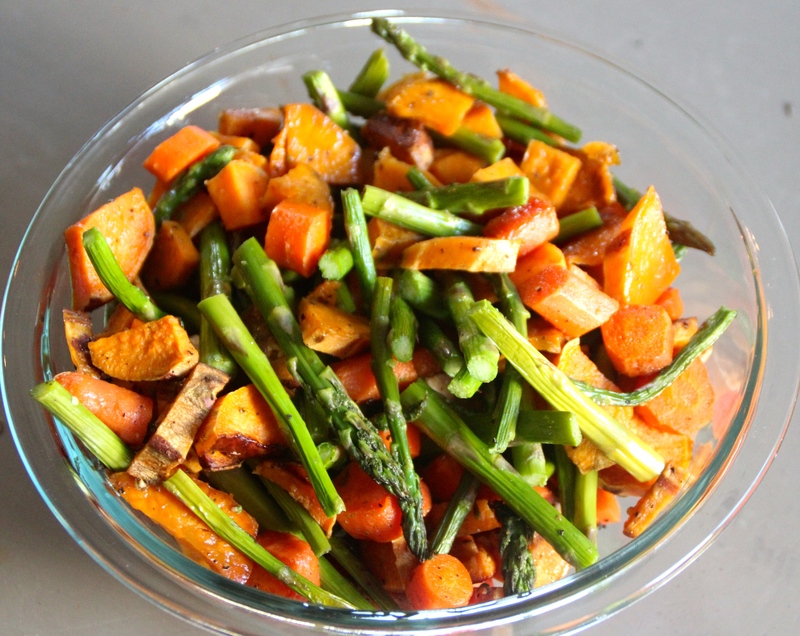 Spread the asparagus over the sweet potato and carrots and bake in the oven for another 20 minutes. Add olive oil and garlic cloves to a sauce pan and simmer for 5 minutes. Add remaining ingredients and whisk until totally fully incorporated. Simmer for an hour. Seriously delicious, give it a shot! But back to the pesto. My kids do like pesto. On pretty much anything. Here is an easy pizza recipe. 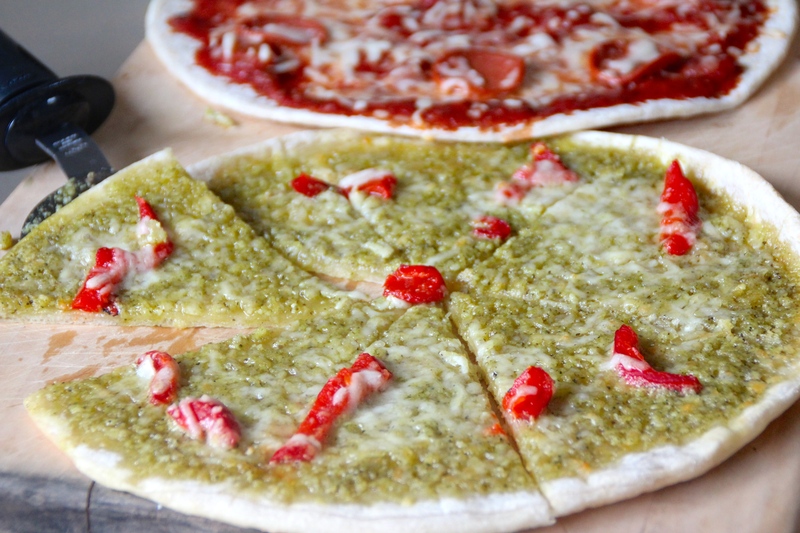 If you do not have time to make your own, just buy the store pesto, but really it’s easy! 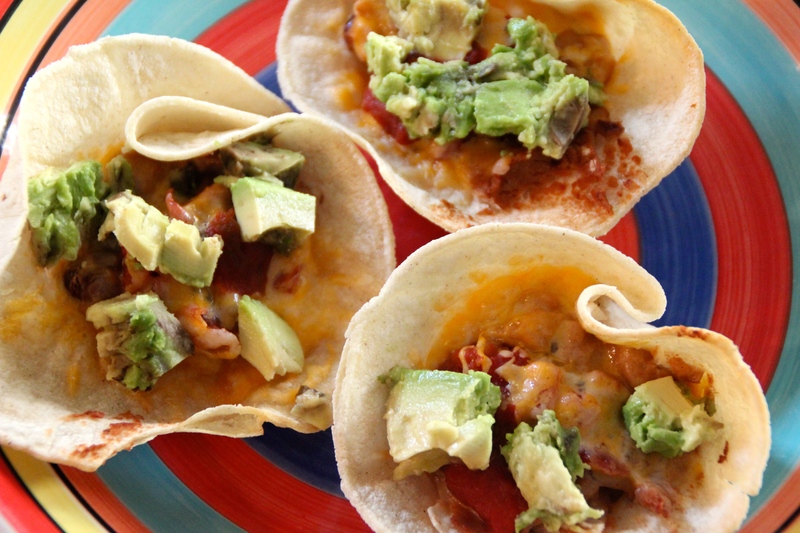 Pile the ingredients in…and whir up that food processor. Also, I like to use walnuts in my pesto. Cheaper than pine nuts and healthier! Here is the recipe I used. 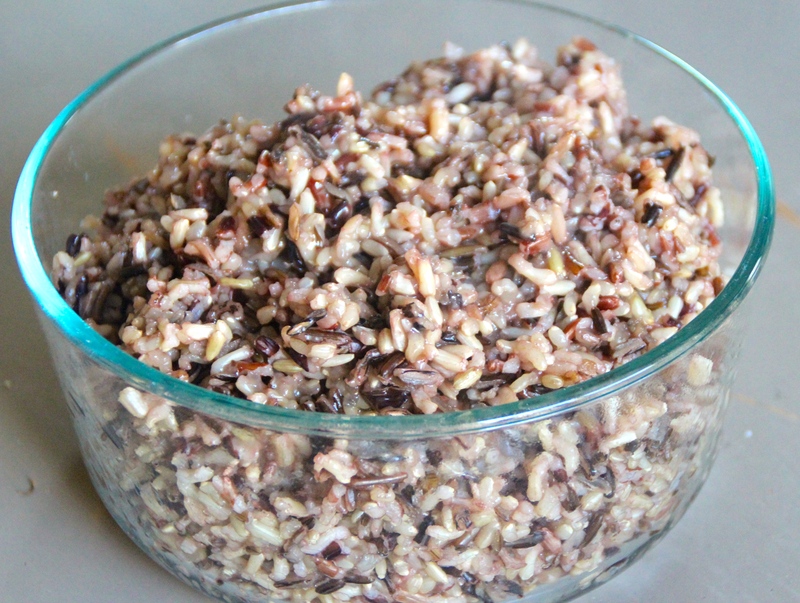 Add walnuts and garlic to food processor and process until coarsely chopped. Add the basil leaves, salt, and pepper and process until mixture resembles a paste, about 1 minute. With the processor running, slowly pour the olive oil through the feed tube and process until blended. 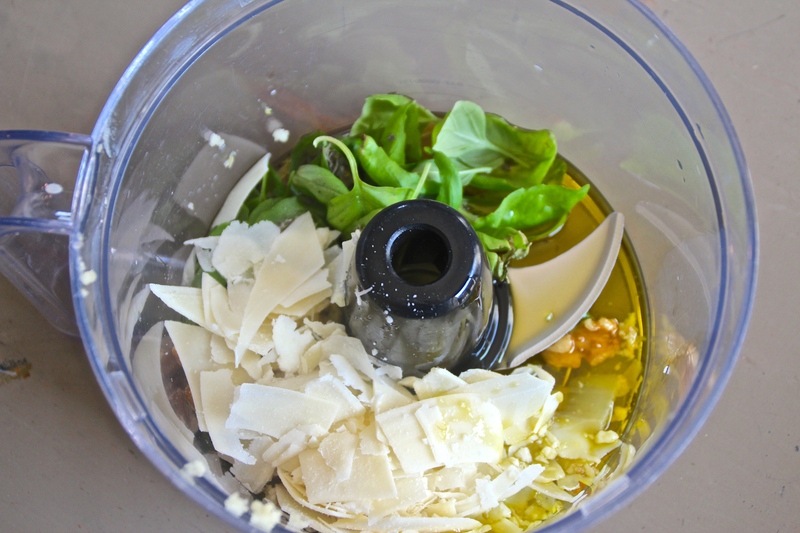 Add the Parmesan and process 40-60 seconds more. 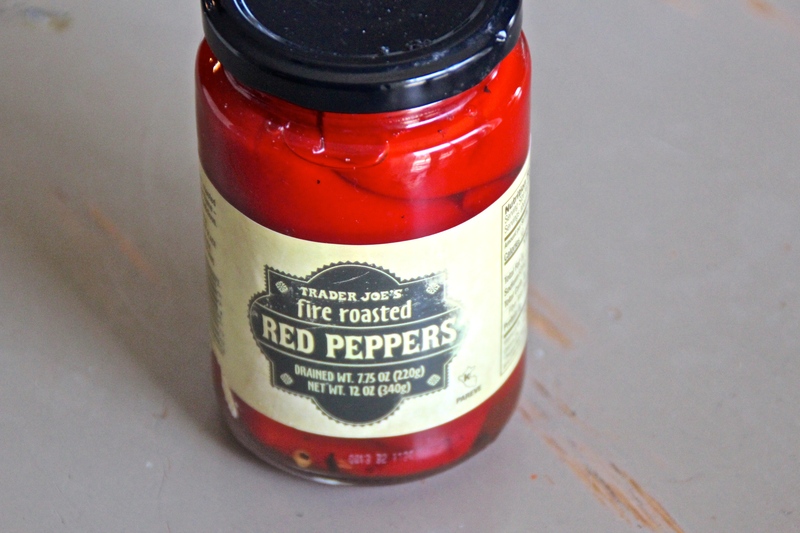 Next grab a jar of these. 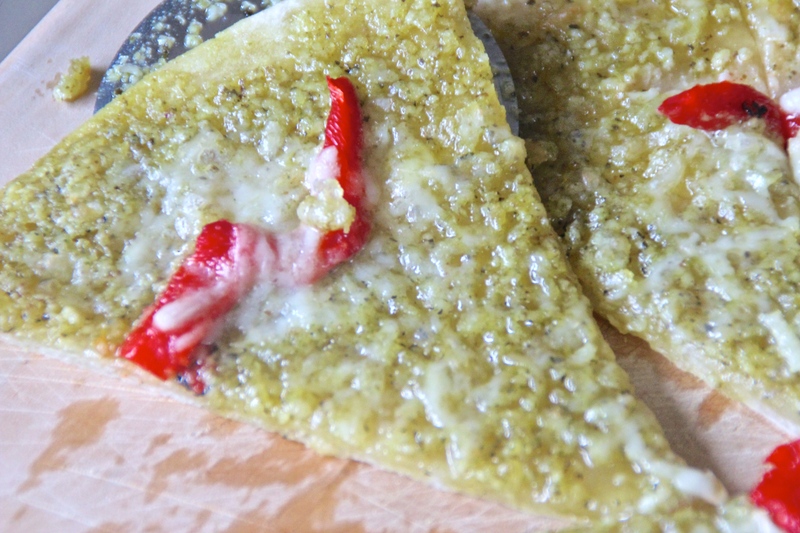 Spread some pesto and red peppers on your crust and cook according to package directions. This here is an organic wheat crust from Trader Joe’s. You could use a Whole Wheat Boboli if it’s easier. This pizza is light on the roasted red peppers because I was a little unsure how the family would react. I had visions of them all being picked off and tossed on their napkins. Surprisingly they ate this pizza without a second thought which means next time the pizza gets doused with red!